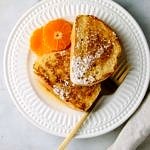 A wonderful vegan french toast to be enjoyed any time of day! In medium size, flat bottom, shallow bowl, mix milk and orange juice. Add choice of sweetener, cinnamon and optional vanilla extract, mix well. Melt coconut oil on griddle/skillet at about a medium high heat, lightly dip both sides of toast in mixture and cook until golden brown on each side, approx. 2 – 3 minutes per side. After dipping 3 or 4 toasts you may want to add a few more dashes of cinnamon to the mixture, it floats on top and will most likely be gone after the first few dips. Serve with pure maple syrup and garnish of choice. Serves about 3 – 4, depending on how thick you slice your bread. Nutrition information is based on 1/2 loaf of bread, or about 6 slices.